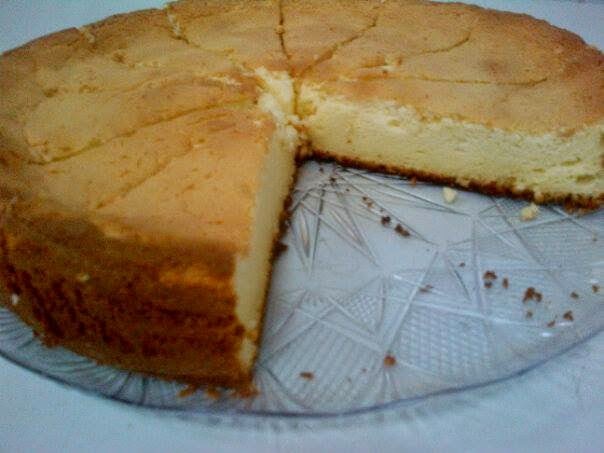 Cotton Cheesecake, a unique tasting cake that is a cross between a sponge cake and a cheesecake. Not overly sweet, this cake will be everyone's favorite and your new go-to dessert! 1. Preheat the oven to 315 degrees Fahrenheit. 2. Separate the eggs and place the egg whites into a mixing bowl and the yolks into a measuring cup. 4. In a separate bowl add the cream cheese and milk. Mix on Low speed until creamy and smooth (approx 2-3 mins.) Add the butter, sugar and lemon juice and beat for 1 minute. Add the flour and cornstarch and mix for another minute. Finally add the egg yolks and mix for 1 more minute. Strain the batter using a sieve. 4. Add 1/3 of the egg whites and gently fold into the batter until mostly incorporated. Add another 1/3 and gently fold. Add the remaining 1/3 and gently fold. 5. Pour the batter into the lined springform pan. Spread the batter evenly into the pan and smooth out the top using a spatula. Holding the sides of the pan, gently lift and drop the pan on the counter about 6 times to remove any big air bubbles. 6. Bake the cake for 1 hour. Check the cake for doneness by inserting a toothpick into the center of the cake. It should come out clean.